This innovative videowall positions the company as a creative and tech-advanced place to work. As seen in this image, individual LED panels are in rotational mode, and they will create a dramatic, mosaic-like visual experience. 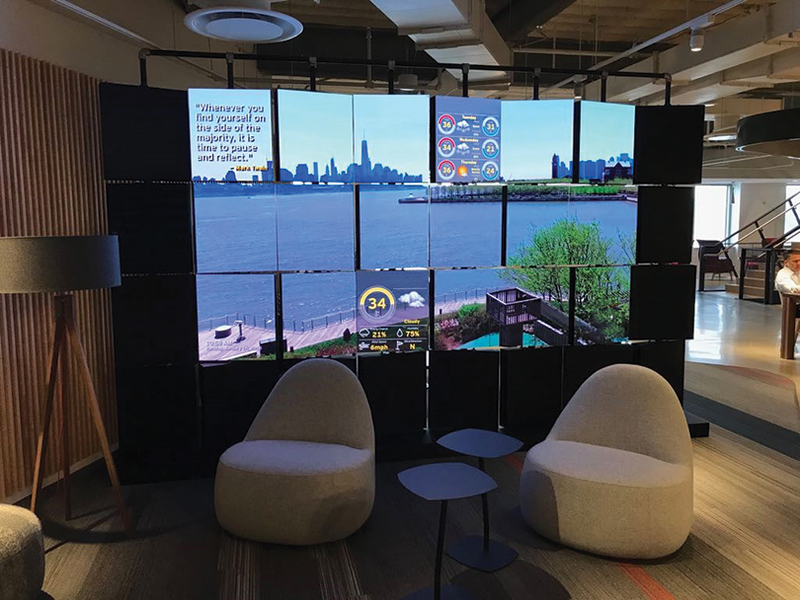 The latest display panels and tiles offer stunning picture quality—more than enough to catch the eye of passersby—and the impact of these screens is multiplied when they are combined to create a spectacular videowall. The displays and other gear needed to build videowalls are now easier to integrate and install. Specialized tools—from configuration software and modular display panels, to flexible mounting systems and multi-window image processors—are readily available to meet the unique needs of clients in almost any market segment. Multinational corporations in the technology and financial services industries are among those taking advantage of these advances, building new regional headquarters with innovative, high-profile, client-facing technologies that help to distinguish them from their competitors. Extensive customization of videowall systems is often required due to the location, environmental factors or the special priorities of the client. Whatever the reason, these special needs and their related challenges provide potentially profitable opportunities for integrators that have the required expertise and experience. Corporate videowall styles often follow innovative uses in multiplex cinemas and sports arenas. In the past, when displays were mounted in herringbone patterns in movie theaters, the demand for a similar look came from museums and large corporate clients. Several integrators found such jobs to be a formidable challenge, because conventional display mounts were not designed for angled installations; neither was it a simple task to conceal media players and image processors discreetly in these installations. But, with today’s cutting-edge mounting technologies, videowalls can be custom built to almost any configuration and specification. Earlier this year, a major company opened a new office and learning center for more than 1,000 professionals in the New York metropolitan area. The four-story office space features advanced technologies to support high-performance collaboration and learning, including an innovative, custom-built videowall in the reception area. Knowing that the backstory would provide useful and interesting information, I spoke with the systems integrator, who requested that the client remain anonymous. Most custom projects require close collaboration both with the client and between the vendors, and this was no exception. General contractor Gensler, an integrated architecture, design, planning and consulting firm, based in New York NY, provided the conceptual design, which called for the ability to rotate each display. As one of the client’s preferred systems integrators, AV-Tech Media Solutions (Roswell GA) was contracted as the AV consultant, designer and integrator for the multi-million-dollar AV systems in the new offices. The digital display features 18 Primeview 1.6mm-pixel-pitch LED panels (PRVLEDSML16TV), each measuring 16″x9″. 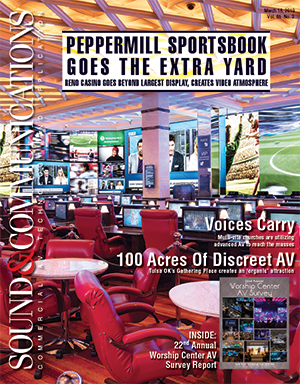 FourWinds Interactive (Denver CO), which manages the company’s digital signage network, supplied one media player and the content-management software. The system also includes a dedicated PC with DisplayPort interface, Primeview’s videowall server with a proprietary controller that offers 12 full HD inputs and 12 full HD display-synchronized outputs, and Primeview’s 4K LED processor/scaler. The videowall serves as a partition that divides a large, open area into two functional spaces. When the panels are rotated, the image appears as a mosaic. “The rotating ability allows content to be created for individual panels or using the whole pixel space as an artist’s canvas,” Thrasher said, noting that the “broken-mosaic” image creates a dramatic effect. The reception area is the first impression that visitors get of the company, so the wall had to serve as a communications medium for delivering high-impact, branded messages to guests and employees when they enter the main-floor reception area. At the time of this writing, the content displayed was scenic video with an inspirational message; other content on the playlist shows people at work. The content is created by the client, based on specifications provided by AV-Tech. Discussing the challenges of this project, Thrasher said, “Honestly, the biggest one was working out the details of building an actual, working videowall with the client, based on their vision as presented in a rendering of what had been imagined, as well as making sure the wall could be built to meet the design intent.” Clearly, taking a project from concept to completion requires a full slate of skills—collaboration, negotiation and expertise in specific areas, as well as the ability to establish trust and build strong relationships. Videowalls for digital signage are used in a variety of settings, from corporate lobbies and retail stores, to sports arenas and train stations. It is important to understand the communication objectives of these display solutions in order to design properly and select the appropriate system hardware, as well as the best tools to drive content to different zones of the videowall.